This is a superb piece of work Robin. Love the use of the different frame in the centre ... and the b/g's spot on! Thanks guys for looking. Right now this is my desktop. I am going to print it out and frame it as well, but I may as do individual prints and frame as a group. I will posting more Through out the weekend. Stay tuned. This is really cool...what a great montage! Thanks Tracy and Terri. Tracy those were the first photos I processed, and I have been looking at that on my desktop since Oct. It has kept me going through this catalog nightmare to finish so I could finish my photos. I am getting ready to go to bed, and when I get up I am going to be an uploading fool with the NYC pics. Robin that is awesome !!!!! 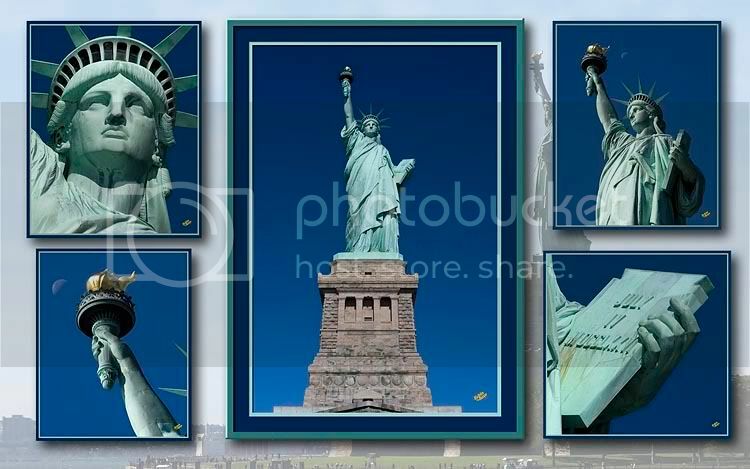 I love the way the shadows of Liberty are coming out onto the background !!! Well done !! So I guess today would not be a great day to call just to chat then huh??? You can call if you want, but I will not be much of a talker. My fingers will be flying over the keyboard upload and posting.